When you spend an Easter break in Europe there aren't too many places where you can be guaranteed to have hot, sunny beach weather. Since that's the case, sometimes you just embrace the fact that it's practically still winter and you'll be packing some sweaters, scarves, gloves, and jackets. Now that our days are officially numbered in Germany, we've got a short bucket list of places to see while we're still here. Our two-week Easter break was our last chance to have a lengthy getaway so we chose to check out a strip of "eastern" Europe, beginning in Krakow and heading south through Budapest, Hungary before finishing off with a drive along the Dalmatian Coast in Croatia. (Note: some would consider this "central" Europe, but it's all relative anyways and besides.........all of these places were formerly behind the "Iron Curtain" so I'll call it eastern Europe, albeit a beginner's version). Despite living under an atheistic socialist regime for years, Poland is considered by some to be the most devoutly Catholic country in Europe. We had heard great things about Krakow and decided to check it out for a few days. 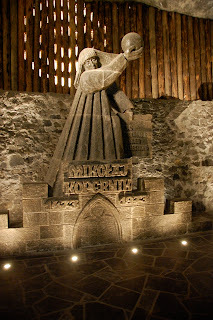 This post focuses on a side trip that we took from Krakow to the nearby Wieliczka ("veel-EECH-kah) salt mine, which initially doesn't sound very cool, but it's actually a very unique site with a long history and a most-impressive interior decor. 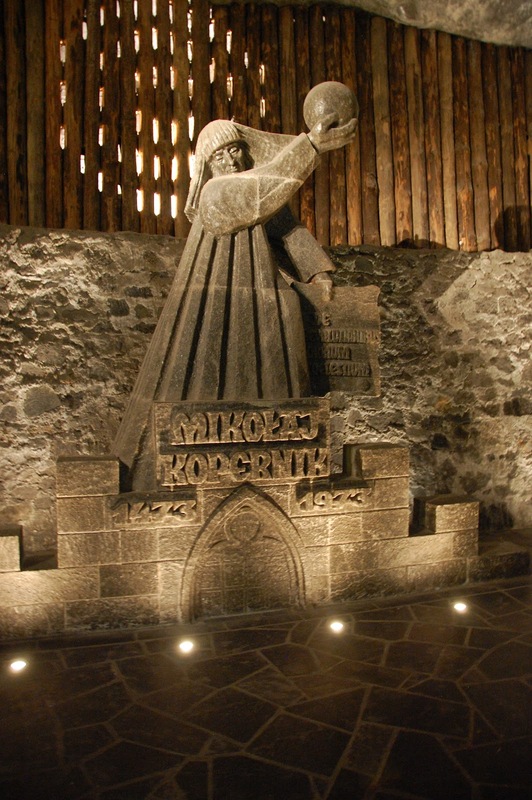 The salt mine has been in use since the 11th century and was the source of great wealth for Poland under king Kazimierz the Great. The mine is unbelievably vast, including about 2000 large chambers, of which we saw about 20 on our 1.5 hour walking tour (443 feet down). Walking around and licking walls is one thing, but the real draw to this site is the collection of statues and chapels that have been carved by miners since the 19th century. Below are some photos of these impressive sculptures...........all entirely made of salt! As you enter the mine your first task is to descend these steps as far down as you can see, and then some. Not sure about the exact count, but it was hundreds. The infrastructure of the mine is all wooden, as metal would corrode in this environment. Literally all of the walls, ceiling, and floors were entirely lickable.......on second thought that's not so special because technically you could like any wall, ceiling, or floor, but these are all salt (around 95% pure if I remember right). We were also encouraged to pluck salt crystals off of low-hanging ceilings to taste. The test came back positive - it's salt! Here I was contemplating how much better it would be if this were a sugar mine. The first work that you come across is this sculpture of Nicolaus Copernicus (Mikolaj Kopernik in Polish, his home country). This is the only work done by an artist from outside the mine. He is beloved by his countrymen and is most famous for formulating the heliocentric theory - that the Earth revolves around the Sun, not vice versa. He actually visited this mine in the 15th century. 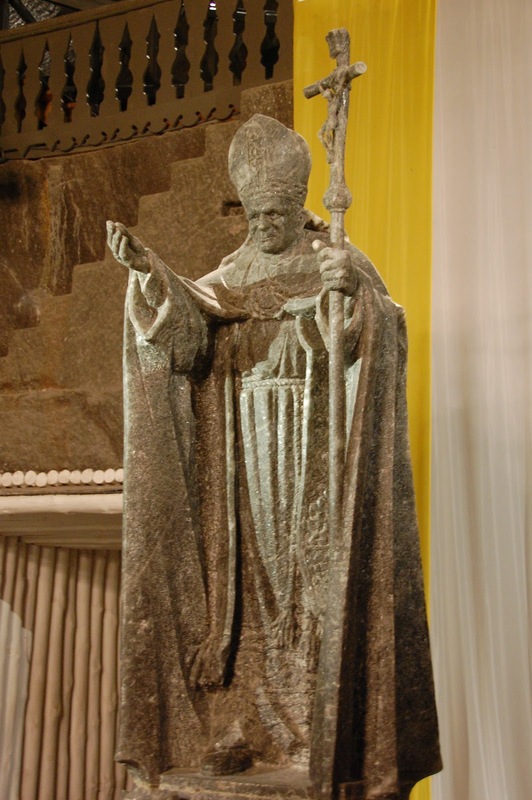 So three miners spent the majority of their careers in the mine carving out chapels and adorning them with sculptures (mostly religious) and chandeliers such as this one. St. Jadwiga (on left) was "king" of Poland succeeded Kazimierz the Great at the end of the 14th century and his regarded as a hero because she married a Lithuanian Prince Jagiello, thus uniting the two kingdoms against the Teutonic Knights (German crusaders basically). She Christianized Lithuania, kicked off the Jagiellonian dynasty in Poland and was actually sainted by John Paul II in 1997. The main attraction is this Chapel of St. Kinga. It was carved in the early 20th century and is loaded with impressive Christian reliefs and sculptures. 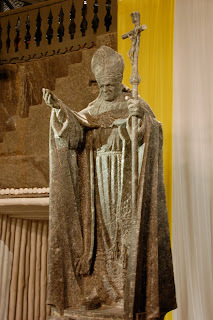 John Paul II - probably the most beloved native of this devoutly Catholic nation. Relief in the Chapel of St. Kinga - keep in mind that these were just talented miners who acted on a hobby, not Renaissance artists. The Last Supper relief is one of the focus pieces here. As you can see, this is not your stereotypical salt mine. I definitely recommend stopping by this one-of-a-kind place if you find yourself in Krakow. Let me know if you come across a sugar mine.